Note: You must provision the cluster with Publicly Accessible set to the value Yes. 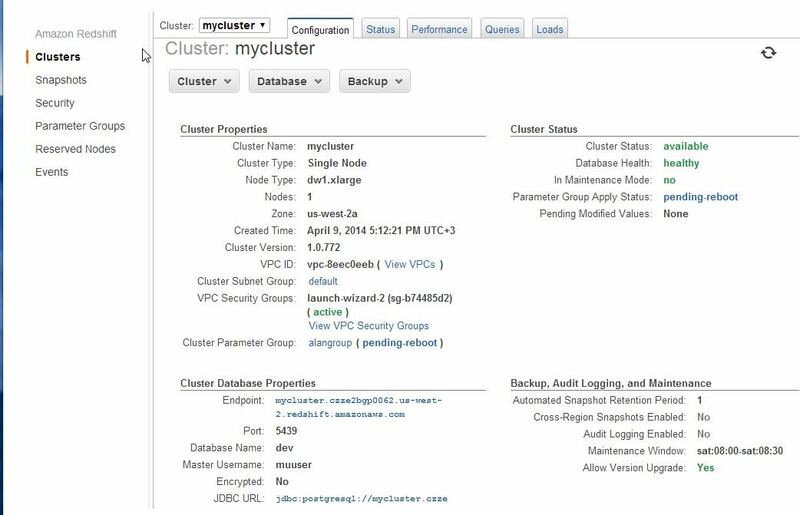 View the instance in the Redshift Dashboard and click on the Security Group. In the Security Group screen, select the Inbound tab. There should be rules for the IP addresses listed here. In each rule select the type of database and enter the Redshift port. If not, click Edit to change an existing rule or click Add Rule to add the rules. If you created the cluster with a default parameter group, create a new parameter group and modify the cluster to associate to that parameter group. Then access the parameter group and edit it to set require_ssl to true. In the Connection Type dropbox, choose CIDR/IP. In the CIDR/IP to Authorize field, enter the IP addresses from this list. If you intend to only append data into a table, give the user minimal permissions required to execute the COPY command. If you intend to merge data into a table, give the user minimal permissions required to execute the COPY command, create a table, and insert and update to your target tables. Click Connections, then click new connection and click Amazon Redshift. If you allow direct access from Xplenty's IP addresses, enter the hostname and port. If direct access it not allowed, read more about setting a tunnel connection here. Enter the default database to use. If you leave it empty, the user's default database will be used. Set the region to the AWS region in which the Redshift cluster was created. If the region requires AWS Signature v4 (see list here) you may need our support team's help with allowing Xplenty access to read from this Amazon Redshift connection. Click test connection. If the credentials are correct, a message that the cloud storage connection test was successful appears.